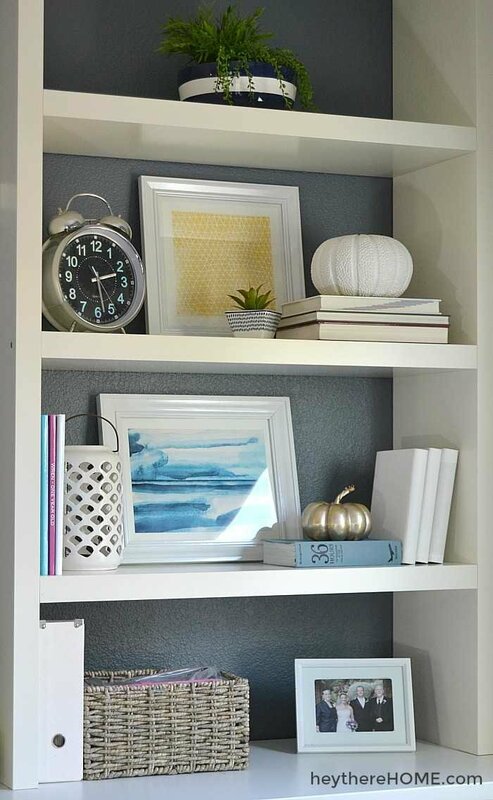 Inside: Try these 3 easy tips that make the transition to fall decor so doable! This post sponsored by Pier 1. All opinions are my own. I have to admit, every year I’m a bit torn. I don’t live in a climate where fall hits us very hard so going all out with the fall decor seems a bit strange, but I do enjoy switching up my decor to fit the season and change things up a bit. Like I mentioned the other day, I used to let the colors of the season dictate my color choices. In reality they don’t always fit my style so I decided this year to keep with my blues but do them in a bit of a different way. The goal was to stay within my home’s existing color palette, but do those colors in a way that felt a bit more cozy. A bit moody, if you will. I teamed up with Pier 1 and in the end I was able to easily change up my decor and take it from summer into fall with just a few switches! 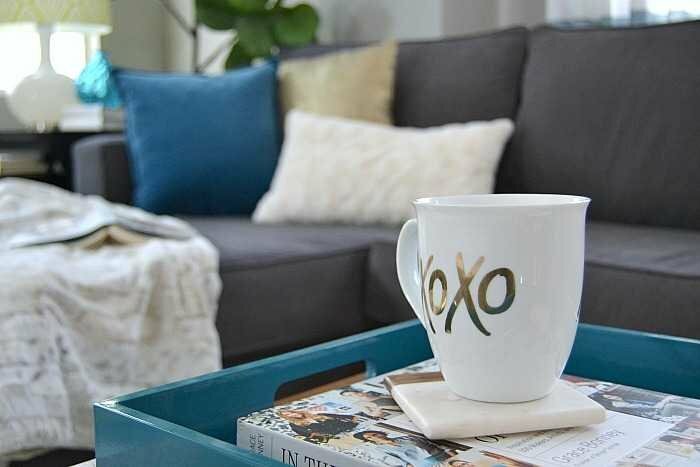 I boiled it down to just 3 easy tips so that you too can transition your home decor from summer into fall. 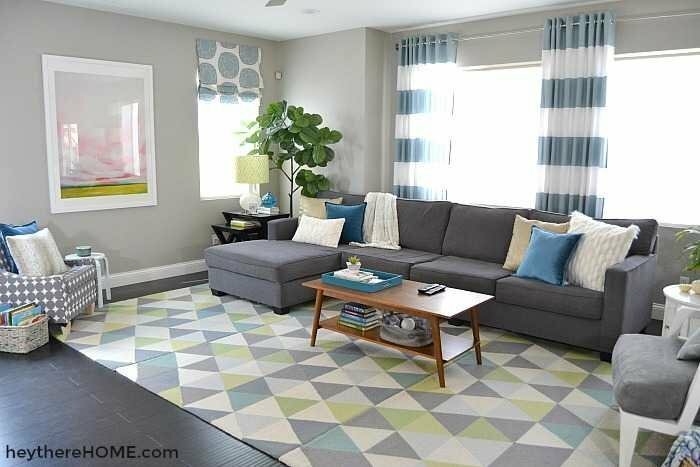 You may remember my family room refresh from this past spring. (If not, you can check it out right here.) I used pops of yellow and pink as my accent colors, which were fun and really perfect for the spring and summer months. 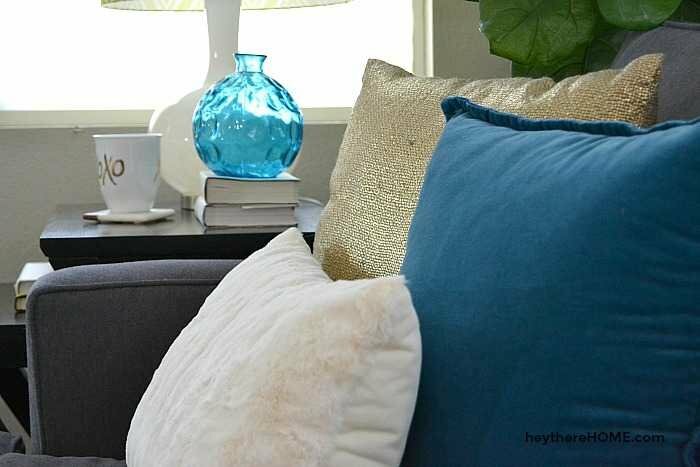 I popped this deep blue color around the room with a few new velvet throw pillows on the sofa, a tray on the coffee table, and some books that I had in a closet. 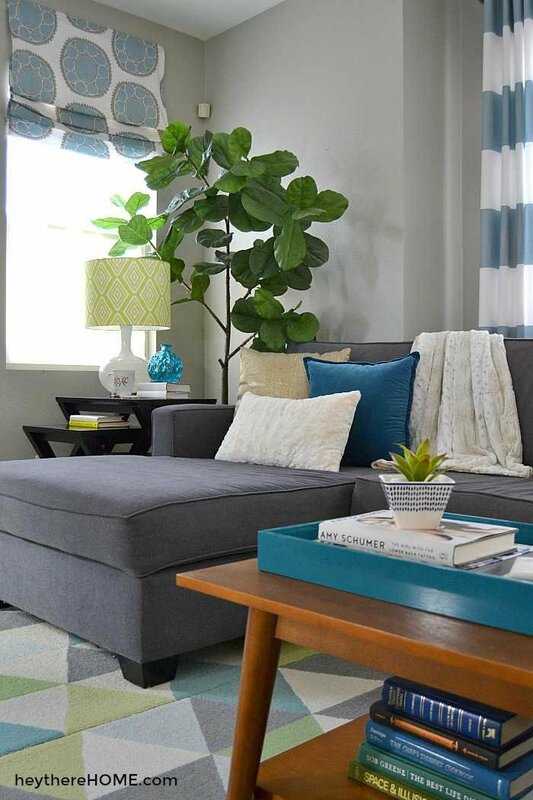 The deep blue works well with the existing lighter blue in my family room because it is in the same color family, just a darker hue. 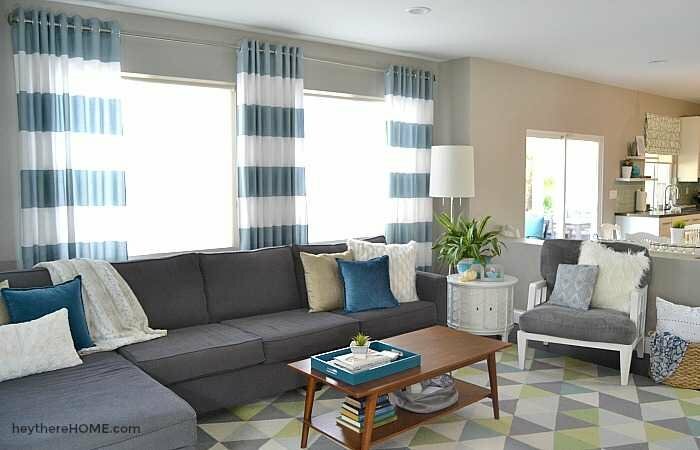 This ensures that the color palette still makes sense and even gives the room a bit more calm feeling. Now instead of having the contrasting (pink) color pop out at you around the room, the room is considered more monochromatic. 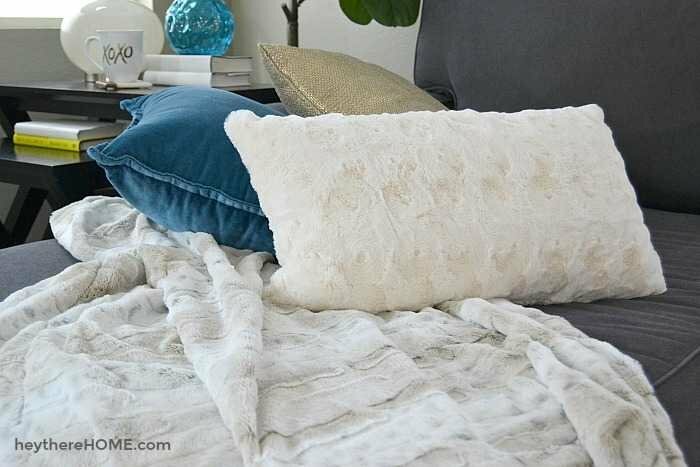 Cold weather means it’s time to cozy up and adding pillows and throws with lots of soft textures is a perfect way to have decor that fits the season, but is also really comfy and useful. There were lots of soft furry pillows and throws to choose from at Pier 1 but I decided to stay with whites and creams. 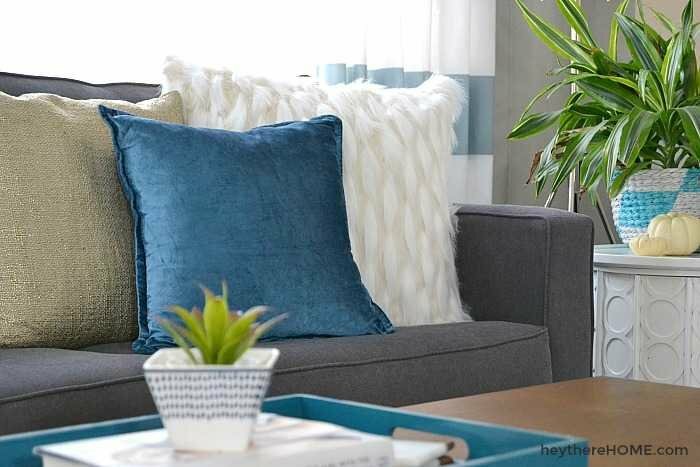 I picked out pillows with different types of fur and in different sizes and shapes to keep it interesting and not too matchy-matchy. 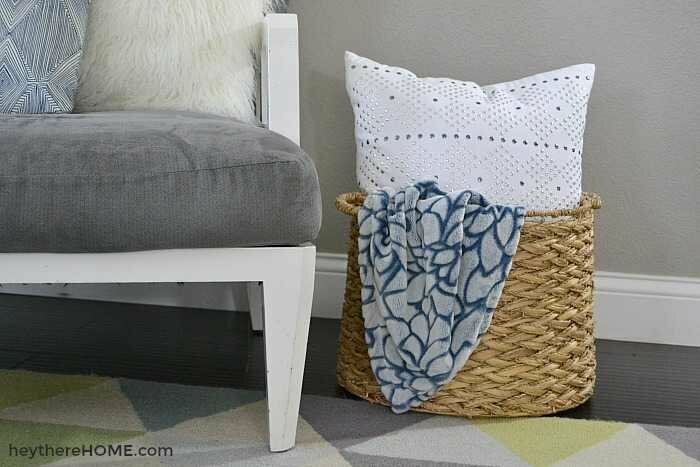 Another great way to add some texture is with baskets and a nice big one is great for throwing in sofa blankets. Best part is you don’t have to fold them! These gold pillows might be my favorite thing in the space. They have just enough texture and are metallic without being too shiny. The best part is that they are soft, and you can actually put your head on them – they aren’t scratchy. I also added just a few gold accessories around the space. 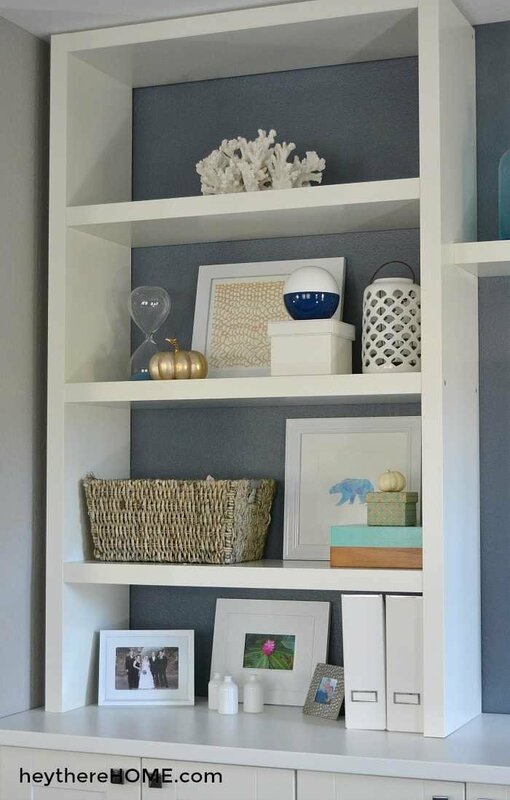 And after taking all of the pink from spring and summer off my shelves, I added a few gold pumpkins and hunted around my house for other deep blue or gold accents to style my shelves with. Across the top shelf (which I always think of as my mantel) I kept the blue bottles, but added some gold and glass flair hammered jars with succulents in them. It’s definitely fun to walk into this room now that it has just a slightly different look and feel to it. I can definitely see us snuggling up in there to watch movies this fall and winter and enjoying more nights in. I am redoing my living room and love these curtain panels. Where did you get them? Are they grey or blue? Hey Jen! Guess what – I made those curtains easy-peasy for shower curtains! Yup! And this post tells you how. Love the blues! Love it all! 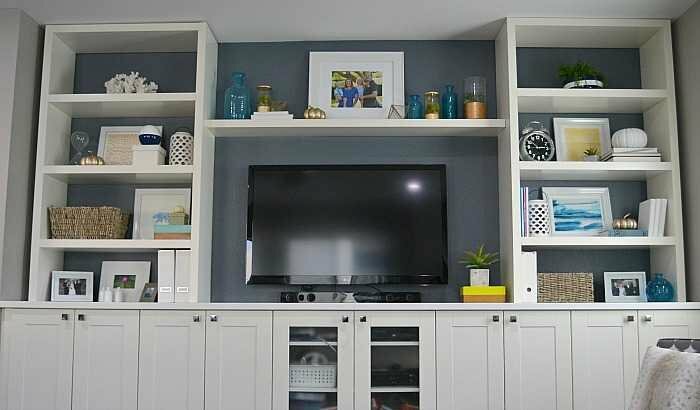 Could you please tell me the color used behind the shelves? Hey Mary! I love that smoky gray color, too! It is Distance by Sherwin Williams. 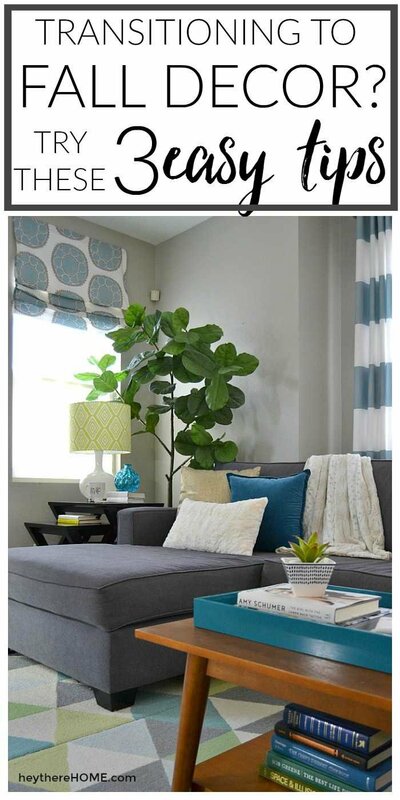 Click to get the lowdown on all my paint colors. 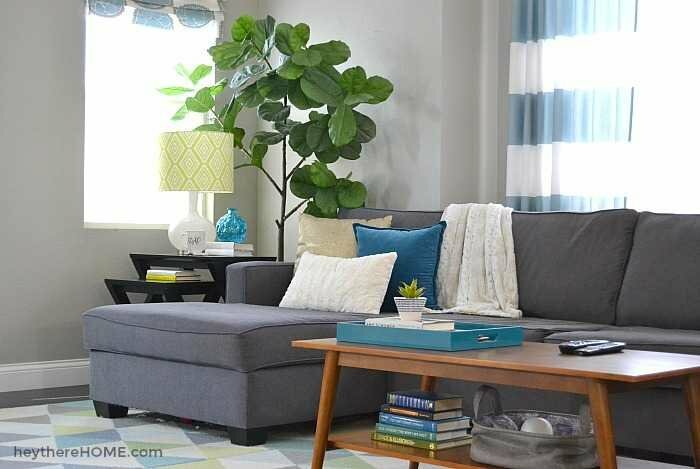 Hi, I have been looking for a couch of this size, can you tel me the make, model, and where your purchased it from? Hi Kris. I got it at a place here in San Diego called Roomers. It is a warehouse shop that contracts out with small businesses that make the furniture. The styles are based on large brand names like Pottery Barn and such and there is usually one of these types of stores in most cities. The showrooms are always in a warehouse so try googling it in your area or start asking around. I hope that helps! Amazing post! I love your idea about adding textures to the decor. I must admit I never thought of that, but I’ll definitely start thinking of it now. Thanks! You’re so welcome, Sophie! Thanks for being part of the Hey There, Home family! I am building in seasonal transitions in my new decor. I love to refresh the look often. I love how you change out your decor for the holidays without changing the whole room! I’m looking forward to seeing how you do Christmas!